Need more information about booking Home 7269531 ? 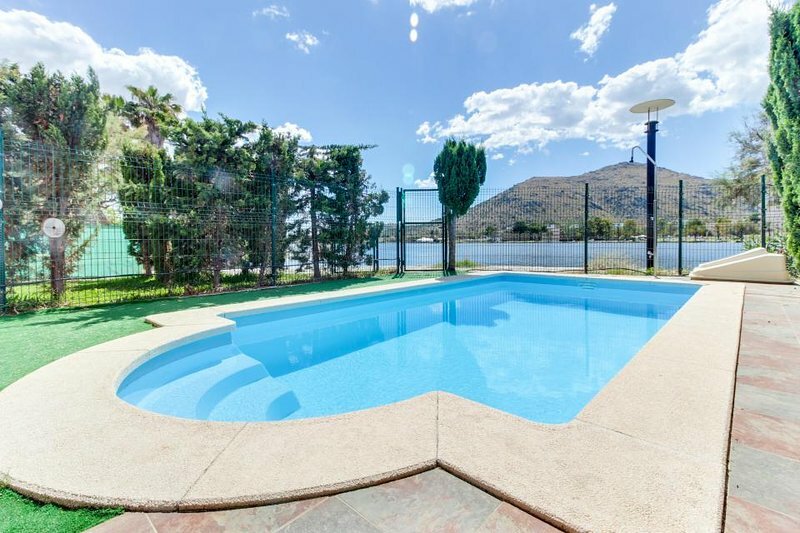 Townhouse with private garden and pool with views of the lake and the mountains that impressed me and I will impress only just come through the door and then only 200 meters from the sea. Near the main tourist areas, bars, restaurants, ... the port is just ten minutes walk 1.5km and you can reach him a short stroll along the beach. recommended to all, families, couples, groups of friends as it is ideal for its location and the possibilities of the environment. Perfect house, perfect location & perfect host. My wife & I stayed here for 2 weeks with our 2 sons, 15 & 13. The location was ideal. The view from the pool & the back of the house was amazing. We used the pool every day. The sun is on the garden all day from late morning which is lovely but there are shaded areas to sit when it gets too warm which is ideal. The host Maria is a really lovely lady & will do whatever she can to help. The beach is a 3 minute walk from the front door with supermarkets that sell everything you need & plenty of bars & restaurants only slightly further. The port is about 20 minutes walk away with more lovely beach bars & restaurants. All in all, you have everything you need for a perfect relaxing holiday with the bonus of an amazing view to wake up to every morning. I would definitely recommend. You can get in touch with Maria Antonia (the owner) through the contact form on this page. Send Maria Antonia (the owner) an email through the contact form on this page. Alternatively, if there’s a phone number on this page, you can call them. How do I contact Maria Antonia (the owner)? If you’ve already booked, go to Manage your holiday booking to view Maria Antonia the owner's contact details or send them a message. Or send Maria Antonia (the owner) an enquiry through the Contact the owner/manager form if you’d like a quote or more info first. When you pay online through the Book your stay form, a booking request is sent to Maria Antonia (the owner). You’ll find out within 24 hours whether they’ve accepted - no money will leave your account before then. You can also request a quote from Maria Antonia (the owner) through the contact form. The owner will email you the total cost for your dates and a link to book and pay online. Use the Book your stay form to pay provisionally online. You can pay by credit/debit card or PayPal. Maria Antonia (the owner) will have 24 hours to accept the booking and no money will leave your account before then. Why can't I call Maria Antonia (the owner) before booking? You’ll need to contact Maria Antonia (the owner) to do this. Send them a message in Manage your holiday booking or through the contact form on this page. You can request to change the dates or number of people on your booking via the Manage your holiday booking page. To change your holiday dates use the Edit booking button. If you need to change the number of guests staying then send Maria Antonia (the owner) a message. If Maria Antonia (the owner) agrees, they’ll send you a revised quote outlining the changes. You can review and accept/decline this from the Manage your holiday booking page. You’ll have 48 hours to take action before the revised quote expires.